Many people may not understand the connection. Yoga is something that others do, tying themselves into complicated knots and holding weird positions forever. Just like, indeed, the lady to the right who also appeared in the Sunday Noon Nudist set recently. Yoga practice at a beach. It is a Hindu spiritual and ascetic discipline, a part of which, including breath control, simple meditation, and the adoption of specific bodily postures, is widely practised for health and relaxation. Yoga is the Sanskrit word for ‘union’. You can do yoga in any form, shape or fashion. It’s up to you how far you want to go. There are simple breathing exercises, simple stretching exercises. If you can’t bend well on your own, you can hold on to a chair. Yoga isn’t the complicated things that most people think. 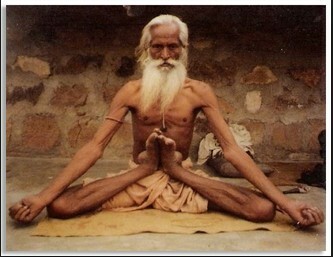 This man is taking his yoga to some extremes with his extremities. Since yoga is something you very much do with your body, it’s always advised to practice yoga with as loose-fitting clothes as possible. Well, how much easier is it then to not use clothing at all. Naked yoga (Google, ) is becoming “a thing” more and more all over the world, which is understandable. Moving without being hindered by clothes is the best, even when many people don’t know this yet. Good article, Paul. Enough to spark my interest and inspire me to check out a possible location for practicing yoga. I like your easy, light way of writing, also.